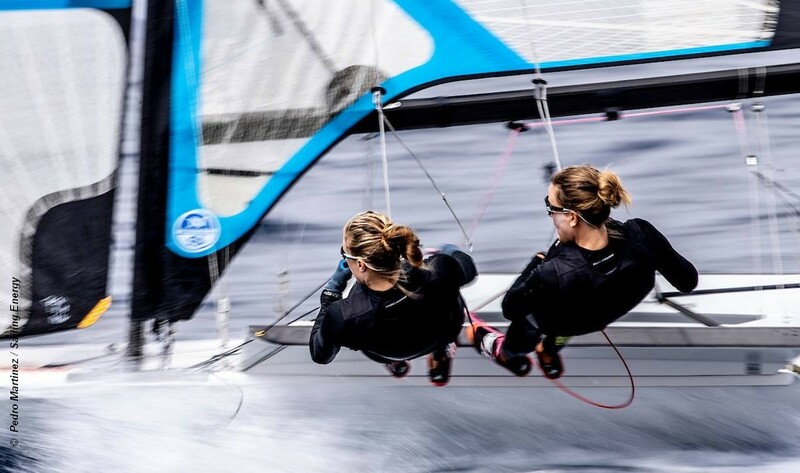 Day 4 of the Trofeo Princesa Sofia Iberostar regatta on Mallorca and the qualification races are running out as we head into the Medal Races on Saturday. Changes expected on the water Thursday as the strong-wind specialists finally got released in 18 to 20 knots of breeze. Some have a way to go to climb into the Top 10, but today and Friday are their big chance to make the medal races. First sign of the changed conditions as Spain’s Joan Carles Cardona joined the men’s RS:X and took a win in race 7. The first three had not bothered to race in the light wind races, so their results have no effect on the overall positions! Britain’s Andy Brown withdrew Wednesday. – Race 7 – 1st ESP Joan Carles Cardona, 2nd BLR Artiom Javadav, 3rd ISR Tom Reuveny. – Race 8 – 1st BLR Artiom Javadav, 2nd CHN Hao Chen, 3rd RUS Aleksandr Askerov. – Overall – 1st CHN Hao Chen 30pts, 2nd HKG Michael Cheng 46pts, 3rd SUI Mateo Sanz Lanz 53pts. Similar story in the women where Anastasiya Valkevich has struggled in the 30+ area and now takes a win in race 7. Britain’s Bryony Shaw also returned to the fray after missing four races. – Race 7 – 1st UKR Anastasiya Valkevich, 2nd NED Lilian de Geus, 3rd HUN Sara Cholnky, 4th GBR Bryony Shaw. – Race 8 – 1st CHN Yue Tan, 2nd CHN Xiaomei Fu, 3rd HUN Sara Cholnoky, 4th UKR Anastasiya Valkevich, 5th GBR Bryony Shaw. – Overall – 1st CHN Yue Tan 26pts, 2nd HKG Hei Man Chan 41pts, 3rd CHN Jie Du 46pts. – Race 7 – 1st ESP Botin Le Chever and Lopez, 2nd POL Przybytek and Kolodzinski, 3rd POL Buksak and Wierzbicki. 10th GBR Fletcher and Bithell. – Race 8 – 1st NZL Burling and Tuke, 2nd ARG Lange and Lange, 3rd DEN Warrer and Jensen, 4th GBR Fletcher and Bithell. – Race 9 – 1st GBR Fletcher and Bithell, 2nd ESP Botin Le Chever and Lopez, 3rd NZL Burling and Tuke. – Overall – 1st GBR Fletcher and Bithell 25pts, 2nd ARG Lange and Lange 33pts, 3rd ESP Botin Le Chever and Lopez 39pts. – Race 7 – 1st GBR Nick Thomson, 2nd CRO Tonci Stipanovic, 3rd USA Charlie Buckingham. – Race 8 – 1st FRA Jean-Baptiste Bernaz, 2nd FIN Kaarle Tapper, 3rd ESP Joel Rodriguez. – Other GBR – 5th Nick Thomson, 7th Lorenzo Chiavarini . – Race 7 – 1st FRA Lecointre and Retronaz, 2nd Skrzypulec and Ogar, 3rd ITA Di Salle and Dubbini. GBR – 5th Mills and McIntyre, 22nd Seabright and Carpenter. – Race 8 – 1st SLO Mrak and Macarol, 2nd ISR Bar-Am and Tibi, 3rd BRA Oliveira and Barbachan. – Overall – 1st FRA Lecointre and Retronaz 32pts, 2nd GBR Mills and McIntyre 35pts, 3rd SLO Mrak and Macarol 44pts. – Race 10 – 1st DEN Nielsen and Olsen, 2nd SWE Bobeck and Tengstrom, 3rd SWE Wester and Netzler. GBR – 10th Weguelin and Ainsworth, 13th Dobson and Tidey. – Race 11 – 1st ESP Suarez and Van der Velden, 2nd NZL Maloney and Meech, 3rd GER Jurczok and Lorenz. GBR – 13th Weguelin and Ainsworth, 24th Dobson and Tidey. – Race 12 – 1st DEN Nielsen and Olsen, 2nd GBR Weguelin and Ainsworth, 3rd BRA Grael and Kunze. – Other GBR – 8th Dobson and Tidey. – Overall – 1st BRA Grael and Kunze 47pts, 2nd NZL Maloney and Meech 66pts, 3rd GBR Dobson and Tidey 68pts. – Other GBR – 7th Weguelin and Ainsworth 85pts. – Race 10 – 1st ITA Bissaro and Frascari, 2nd GBR Gimson and Burnet, 3rd ESP Pacheco and Trittel, 4th GBR Saxton and Boniface. – Race 11 – 1st ITA Bissaro and Frascari, 2nd ITA Ugolini and Giubilei, 3rd AUS Darmanin and Copeland. GBR – 7th Saxton and Boniface, 8th White and Urwin, 12th Gimson and Burnet. – Race 12 – 1st ITA Tita and banti, 2nd AUT Zajac and Matz, 3rd AUS Waterhouse and Darmanin. GBR – 6th White and Urwin, 7th Saxton and Boniface, 9th Gimson and Burnet. – Overall – 1st AUS Waterhouse and Darmanin 52pts, 2nd GBR Gimson and Burnet 62pts, 3rd ITA Bissaro and Frascari 63pts, 4th GBR Saxton and Boniface 69pts. – Race 7 – 1st AUS Belcher and Ryan, 2nd JPN Okada and Hokazono, 3rd SWE Dahlberg and Bergstrom. – Race 8 – 1st ESP Xammer and Rodriguez, 2nd CHN Au and Wang, 3rd SWE Dahlberg and Bergstrom. – Overall – 1st SWE Dahlberg and Bergstrom 29pts, 2nd Patience and Grube (5,10) 43pts, 3rd NZL Snow-Hansen and Willcox 49pts. – Race 7 – 1st GBR Ed Wright, 2nd NOR Anders Pedersen, 3rd POL Piotr Kula, 4th GBR Giles Scott. – Race 8 – 1st HUN Zsombor Bereecz, 2nd GBR Giles Scott, 3rd POL Piotr Kula. – 5th GBR Ed Wright. – Overall – 1st NZL Andrew Maloney 28pts, 2nd Giles Scott 39pts, 3rd NZL Josh Junior 39pts. – Other GBR – 8th Ed Wright, 19th Henry Wetherell. – Race 7 – 1st NED Maxime Jonker, 2nd POL Magdalena Kwasna, 3rd JPN Manami Doi. – Race 8 – 1st NED Maxime Jonker, 2nd FIN Tuula Tenkanen, 3rd USA Erika Reineke, 4th GBR Alison Young. – Overall – 1st DEN Anne-Marie Rindom 29pts 2nd SWE Marit Bouwmeester 48pts, 3rd USA Erika Reineke 51pts. 14th GBR Alison Young.